One aspect of Edgar Rice Burroughs’ story that has always intrigued me is his film company, Burroughs Tarzan Enterprises, which he set up in 1934 with Ashton Dearholt, and which made The New Adventures of Tarzan, which was later re-released as Tarzan and the Green Goddess. The adventures of Burroughs in attempting his own film company are well worth learning more about. The short version is that in 1934 Ashton Dearholt, a friend who was a bit of a dreamer (putting it nicely), managed after several tries to finally present Burroughs with a proposal to form a company to produce films. They set it up with offices in Hollywood at 8476 Sunset Boulevard, and offices in New York at 1270 6th Avenue. It was a 60/40 deal with Burroughs financing and owning 40%, and the other 60% split between Dearholt, George W. Stout, and Ben Cohen. 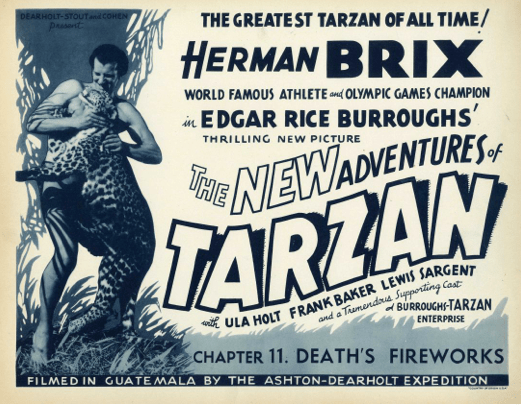 The first thing the company produced was called “The New Adventures of Tarzan”, starring Herman Brix as Tarzan. It was filmed almost entirely in Guatemala and was released in 1935 as a 12 part serial, and also as a 10 reel feature film released eventually as Tarzan and the Green Goddess. The company also pitched numerous of Burroughs properties to Hollywood studios. Dearholt was an actor who had worked with Universal Studios on a number of melodramas during the 1910s. But he usually worked outside the studio system, producing a series of “Pinto Pete” western during the 1920s in which he starred himself. He occasionally acted under the name Richard Holt. He founded Ashton Dearholt Productions in 1924. During the production in Guatemala of the New Adventures of Tarzan,, , , Dearholt married the leading actress, Ula Holt and Burroughs, who went to Guatemala for the filming, broke up with his first wife to marry Dearholt’s ex-wife, Florence Gilbert. There’s a lot more to this story — I’ve often thought that a movie about all this has great potential. Here is Tarzan and the Green Goddess — the complete film. Herman Brix is actually great! He perfectly embodies both the nobility and the physicality of Tarzan. Ashton Dearholt’s remains are at the Hollywood Forever Cemetary, as well as those of first film Tarzan, Elmo Lincoln. Just one more addition of note. Herman Brix, also an Olympic star (shot-putter in 1928), according to IMDB, lost out on the Tarzan role previously when he was up against Johnny Weismuller. By 1939, he had changed his name to Bruce Bennett. He died in 2007 after a long career as a working actor that ended with his last role in 1980 that included quite a few guest roles on television as well as small roles in such movies as “Love Me Tender”, “Mildred Pierce”, and “The Alligator People”.